Unless voters take back control of Congress from the corporate interests that have, in essence, purchased it through campaign contributions, the United States may collapse under its debt load or worse. This doesn't have to happen as there is a direct and specific thing Citizens can do. It boils down to one sentence: DON'T VOTE FOR ANY INCUMBENTS. When you go to vote in congressional elections, carefully look over the candidates and any NEW names you see on the ballot, vote ONLY for them. If you're not particular about parties, don't worry about whether they're Democrats or Republicans -- just vote for anyone that's NOT an incumbent. If you must vote your party, vote ONLY for the new guy. Don't vote for ANYONE that's already in office and trying to run again in your party. This revision comes on the day after the Obama-McCain election where I was able to put into practice what I am recommending above. If you click here you can see a copy of the "GENERAL ELECTION SPECIMEN BALLOT" that was presented to me just before I went into the voting quarters. Both the Democrats and Republicans (aka GOP) hand these out to "help" you vote for their candidate. The graphic I am using here happens to be a Republican specimen so that's why all the Republicans are blackened in. Just ignore this. The names that are circled are who I voted for. So what you do is you take this "Specimen" and place a check mark next to all of the incumbents. You can see my check marks. If you don't know who is an incumbent, ask people around the voting quarters. As you can see I didn't know who all the incumbents were and I found by asking others in the area that most of them did NOT know either. Shameful on all of us. 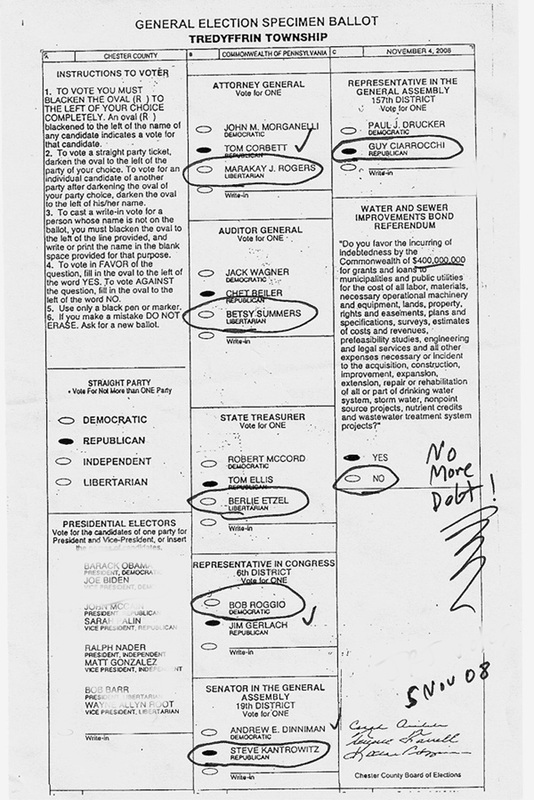 Again, the names that are circled are who I voted for. Again, if you examine the Specimen here, you can see that I avoided voting for every incumbent by voting for a Dem or GOP each time BUT, where available, I always voted Libertarian, as Libertarians usually aren't incumbents. For posts where I didn't know who was the incumbent and there was no Libertarian choice (such as Rep in the Congress 6th District and Rep in the General Assembly 157th District) I spread out my vote for a Dem and a GOP, hoping neither was an incumbent. By not voting for any incumbents it's true -- you may be flushing out some good people -- but you have to look at the bigger picture. The majority of the Congress is entrenched. The Founders had no idea people would stay in office so long otherwise they would have placed term-limits on congressmen and the executive from the start. Back in the 18th Century transportation was a problem and the country had a very small population. Thus the Framers wanted to place as few disincentives on people as possible because they wanted people to travel great distances and take part in the government. If there were term limits of say 2 or 4 years, many people would have never run for office because it wouldn't have been worth it. To travel so far, and with such difficulty in a harsh environment where one was needed on the farm simply made no sense. But if a citizen had the opportunity to travel to Washington and make a long-term career of government service, then it made more sense. So this is why we have no term-limits written into the Constitution for congressmen and why the term limit for the president was only written in later. Obviously times have changed. We now have a population of almost 300 million people (plenty of candidates), travel to Washington is no hardship (interstate highway system everywhere) and one farmer can provide for food for thousands of families (mechanized farming). BUT, we now have the opposite problem: an entrenched government that STAYS in Washington too long! Ironically, entrenchment is EXACTLY the thing the Founders did NOT want to happen. They wanted a fluid government where power could easily, and peacefully, be transferred from group to group as the needs of the nation changed. They did NOT want anymore kings or emperors with long lines of succession and the entrenched power that goes with these systems of government. But as I said above, this doesn't have to happen if the People that live in the United States purge the government of the entrenched politicians. My view is that all of them need to go. (4) I know that's drastic, but here's my thinking. If everyone tries to figure out who is "good" and who is "bad," there will be virtually no agreement. People will just fall back on their party lines and the same old, same old debates will continue ad nassium. Thus the only remedy is to flush them all out based on the fact that all of them are in on this together and none of them are causing real change. So if you are a Republican and hate Democrats, fine. Just flush out YOUR Republican incumbents and replace them with new Republican blood. If you are a Democrat and hate Republicans, fine. Just flush out YOUR Democratic incumbents and replace them with new Democratic blood. Both parties will maintain the status quo quantitatively, but BUT, qualitatively, everyone will be new and different. There will thus be no pre-existing social network whereby VOTE SWAPPING (a form of collusion) can take place nor will the social network needed for CAMPAIGN CONTRIBUTIONS (a form of bribery) be available nor will the social network needed for allocating PORK (a form of fraud) be available. The NEW congress of NEW congressmen will be left to do NEW things, new things like doing what they are SUPPOSED to do: honestly represent the wishes of their constituents (without vote swapping) while making choices that will be good for the nation. The gridlock in government will thus be attenuated because this gridlock is caused by collusion, bribery and fraud, elements not wanted or envisioned by the Framers. I will thus bet if the congress is purged -- and it goes without saying that this means the complete staffs of each congressman must go as well -- fresh new legislation will more easily be passed. Insane systems of accounting -- such as COST PLUS -- will be ushered out; the unconstitutional money we currently have will be replaced by Constitutional money; the budget will be balanced; the trade deficit will be remedied; the U.S. will stop engaging in wars all over the planet; we will pull back our military from other peoples' lands or require them to pay for security if they really want it; we will re-allocate the budget to proper and prudent uses (such as alternative non-fossil fuel energy), and we will rehabilitate the nation's once-proud space program and go on to develop vast new technologies that only a courageous nation can do while exploring new real estate on new worlds. In this kind of an environment, science and technology will grow and everyone will benefit. (5) Problems facing humanity will be solved with such an abundance, war will seem like a silly remedy an immature civilization once flirted with. The U.S. will again gain respect around the world -- lead by demonstration, not by the exercise of force or by propagandizing the world through our mass media and biased, violence-oriented pop culture. (1) See the book, EMPIRE OF DEBT, by Bill Bonner. (4) With the possible exception of Ron Paul, who is the only voice in Congress pointing out the fiat money scam which powers the Empire. Ron Paul, M.D., should run for president because this country needs a physician as soon as possible.